There is no "Part II" to this blog as it is integrated into the "Extras" content of TAGAP 2 itself. So if you want to read more on TAGAP 2 design, all you need to do is to download TAGAP 2 and select "Extras" from the main menu. Designing process of TAGAP 2 differs from the original TAGAP right out of the gate. Where the design of the original came together as we went on, in case of TAGAP 2 I started by creating the general guidelines. Naturally more guidelines came to be later on as the game started to shape up, but these general rules where the ones we started with. The upgrades in TAGAP 2 engine make it superior as compared to the original engine in terms of details its able to push. For this reason we decided from the very start that in TAGAP 2 we would try to exploit that everywhere we can. With the original game we were cautious about adding too much detail in order to keep the game A) as light on the CPU/GPU as possible and B) in schedule. With T2, however, the tech being half done the schedule was no longer such a problem and thanks to optimizations CPU/GPU usage wasn't such an issue. So it was decided that every time we would come up with a detail to liven up a character or the environment, we would do so, no matter how tiny thing it would be. As the result TAGAP 2 is filled with tons of details most of you probably will never notice, but it all adds up into a much more lively animation and designs. Look of the original TAGAP was very, VERY hi-tech. There's nothing wrong with that and it was well suited for the first game, but we wanted make more organic and lo-tech in terms of the environments. In practice this means you'll see less sci-fi environments, hi-tech labs and neon-lit semi-cyberpunk cities – and more organic environments and reality-bound industrial motives. This alone makes TAGAP 2 very distinct from its predecessor, as there aren't many levels that would fit in both games. This guideline came to be almost immediately when I started drafting out new robotic enemies. I knew the Penguinators and scavengers would make a comeback, but other than that, I was pretty unsatisfied of the old robot designs. Floating round blobs felt uninspired and with all the detail overkill going on, quite dull. So, I started out by drafting out a redesign of the laser-shooting floating bot from TAGAP. The result was very different, but a lot more interesting with plenty of moving parts and identifiable details. Instantly dubbed as 'BotBee', this enemy and scavenger droids formed the 'insectoid robotics' guideline. In practice it means that with exception of robot penguins, all the robots would be insect-inspired. So you can expect to see a robotic rogues gallery filled with interesting metallic creepy crawlies. 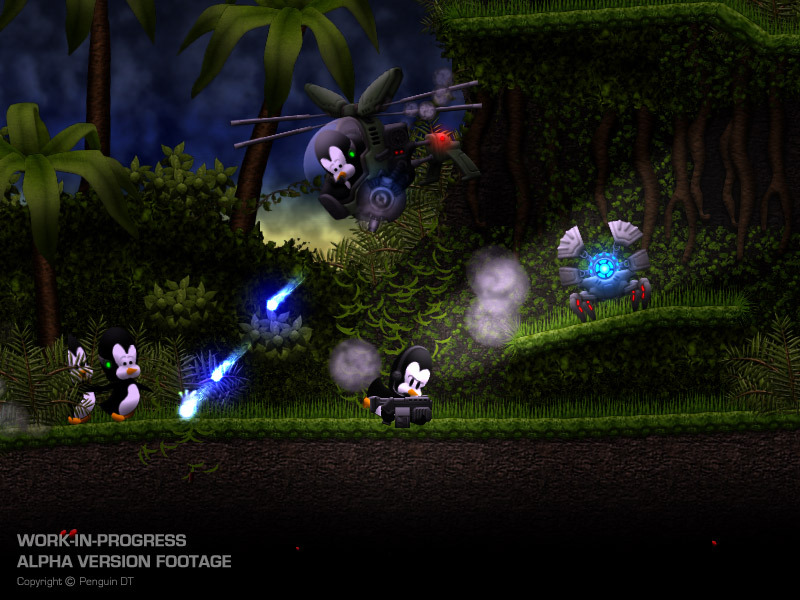 Perhaps the earliest character design choice was a combination of plot elements and the fact there was going to be a split-screen co-operative campaign; We wanted to clearly distinct the 'evil' penguins from the 'good penguins' and give them a unique look. So, we equipped them with mind-controlling headbands with green lights. Later this idea went even further, as the rockhopper elites were introduced. What in the first game was more or less a by-product of TAGAP being a sum of two very different concepts, became an intentional artistic design choice in TAGAP 2. In the first TAGAP the basic assets (i.e. doors, triggers) were designed when the game was still supposed to be about a space penguin in space penguin world, and thusly those assets were scaled to reflect that. Later - when the whole gameplay was transformed into TAGAP you know and we started crafting the world accordignly - Pablo was a penguin escaping from a human lab. As the result the perspective in the game seems a little off, some of the objects being scaled for human use and others for penguins. While this was essentially a design glitch, it gave TAGAP some crooked personality. So, when it came time to craft TAGAP 2 designs, we transformed this glitch into an intentional concept. Basically it works like this; Bigger the object is in relation to the penguin characters, more it is scaled down. For instance fire extinguisher, soda bottle and office chair are in relation to the penguins pretty much life-like in size, but really huge things, like trees, are heavily scaled down. The end result seems pretty much like if the scale perspective was warped around the penguins and now that things are designed like that from the get-go, it looks crooked in a cool way. For a quick reference to what I mean with this perspective warp, here is one of the older work-in-progress screenshots. As you can see here, grass and bushes are pretty much in 1:1 scale compared to the penguins, but the palm trees appear a lot smaller. Speaking of work-in-progress shots, I just realized that this shot, among some of the others, no longer represents how the game looks today. Changes aren't anything too drastic, but there is more detail to the environments. We have dozens of these useful guidelines, but these are the ones that make the biggest difference between TAGAP and TAGAP 2. Next time we dive into actual character designs, so expect to see a healthy dose of both concept art and some new in-game media.